It can be used in ultra-fast Multiscaler/TOF systems, in Time-of-Flight mass-spectrometry and time-resolved single ion- or photon counting. NEW !! Pulse-width evaluation with 100 ps precision enables the user to calculate the area, the pulse height of the detector pulse but also if multiple events have occured - multiple events have a broader pulse width than single pulses. In operation the sweep is started by a user supplied start (trigger) pulse. Then subsequent events detected at the stop inputs are recorded, each in a specific time bin corresponding to the time of arrival relative to the start pulse. Compared to non-multihit devices the P7889 can accept a new stop event as soon as 200 ps after a prior event - limited by the max. count rate of 5 GHz only. The P7889 is designed with fully digital circuitry capable of accepting peak (burst) count rates of up to a full 5 GHz. The P7889 has been optimized for the best possible pulse-pair resolving while providing state-of-the-art time resolution available in digital designs. Two built-in 5 GHz discriminators can be adjusted for a wide range of signal levels. The large single sweep time range enables the user to take data of up to 83 days, with a time resolution of 100 ps. A PLL oscillator assures a resolution of typically <72ps FWHM at a full scale time range of 1 microsec (measured in the last time bin of 4000 time bins, for 30 min). The FIFO memory buffers and the fast 64 bit PCI-bus interface enables the P7889 to continuously transfer data at rates of approx. >22,000,000 events/second. For experiments requiring repetitive sweeps the spectral data obtained from each sweep can be summed in the PC enabling very high sweep repetition rates up to wrap around speed. The P7889 is designed with "state-of-the-art" components which offer excellent performance and reliability. The high-performance hardware is matched by a sophisticated software delivered with each P7889 - providing a powerful graphical user interface for setup, data transfer and spectral data display. A DLL (Dynamic Link Library) with example programs for "C", Visual Basic and LabVIEW is available for operation in a Laboratory Automation environment. Our 2-Year Warranty covers all types of FAST ComTec Multiscalers. 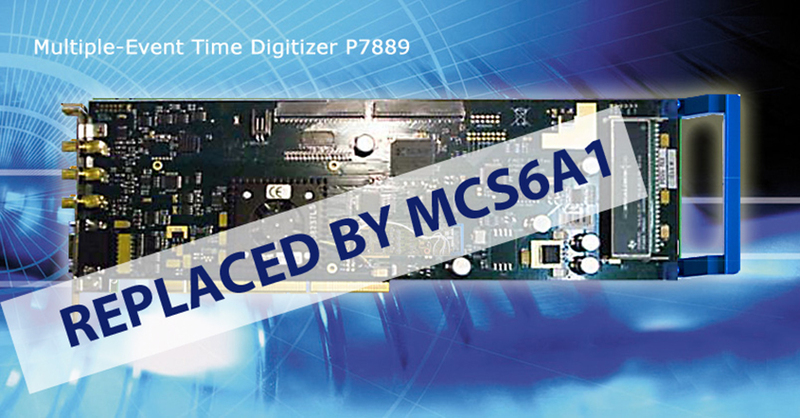 Exceptionally high data transfer rate to PC by using a 64 bit, 66 MHz PCI-bus interface. Fits into any 3.3V PCI-X compliant slot. On-board 1024 x 6.4 ns fast FIFO for ultra fast data transfers. Secondary 32k x 64 bit PCI FIFO for approx. >22,000,000 continuous stop events/sec to the PC for data storage in list-mode or on-line histogramming.